Intellectuals, politicians and journalists gathered in central Russia for four days of discussion about the country’s future. The 10th annual meeting of the Valdai Club opened Sept. 16 with a collective inquiry into the competition between identities at the international and regional levels. 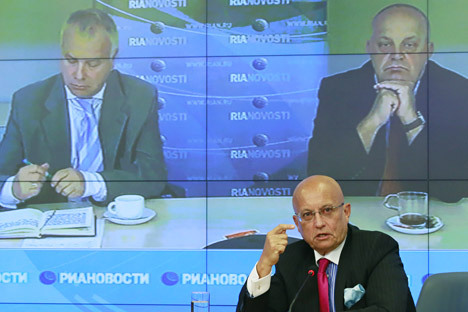 The club, which presents itself as “the main intellectual platform for discussion about Russia,” in the words of political analyst and founding member Sergei Karaganov, is an initiative of Russia’s Council on Foreign and Defense Policy and state news agency RIA Novosti. More than 250 people are taking part in this year’s event, which involves four days of discussion in the town of Valdai in central Russia. Most of the participants are experts on Russia, although political personalities and journalists are also included. This year, the political contingent involves participants from both the establishment and the opposition, including Vladimir Ryzhkov, Gennady Gudkov, Ilya Ponomarev, Yevgeny Roizman and Mikhail Prokhorov. Karaganov opened the first session by introducing questions that are crucial for Russia’s future: “We still have no shared basis for our discussions, neither the Communists or the Nationalists or Bolotnaya [the symbolic centre of opposition outside the system]. We do not know who we are and where we are going,” Karaganov said. Deploring this “atmosphere of pessimism,” Karaganov added: “We have lost the national courage that enabled the Russian people to emerge triumphant from the most difficult episodes in its history.” Despite these remarks, the tone adopted by this political analyst was in no way despondent, on the contrary, he begged the intellectual community to get itself out of a rut. The recently re-elected Mayor of Moscow, Sergei Sobyanin, made a spectacular appearance, landing by helicopter. The content of his remarks and the way in which he answered the dozens of questions put to him by the audience were very much in keeping with what is already known of this personality. Organizers imposed a ban on journalists reporting Sobyanin’s remarks, but much of what he said was expressed by participants on Twitter. Read more: Is the West ready for the rise of the Russian elite? In the afternoon, an absorbing discussion was held with several opposition politicians. Vladimir Ryzhkov criticized the Sept. 8 municipal and regional elections that took place across Russia as well as the “hypercentralisation” of the country around Moscow.